This Weeks Top Men’s Jewellery Pick! This week we have selected our favorite jewellery item of the week, as chosen by our team in the office we have picked out this great looking Leather Cuff bracelet, which is the perfect piece of jewellery for a man. 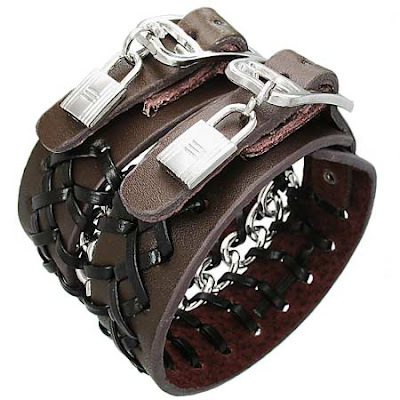 This wide real black leather cuff has an unusual double band design with a central curb link stainless steel chain. It also has an unusual padlock design to make it look like you have been locked into the bracelet. The cuff is 55mm wide and comes with two secure buckle style clasps and five length settings, with the longest being 9in or 23cm. We love it and we hope you will to, it is only £19.99 with FREE UK delivery as standard and we think this offers great value for money considering the work that has gone in to creating this stunning leather cuff bracelet. The bracelet is also available in brown to, so maybe one of each to match what your wearing…?